It was the fifth annual symposium but the first master class. 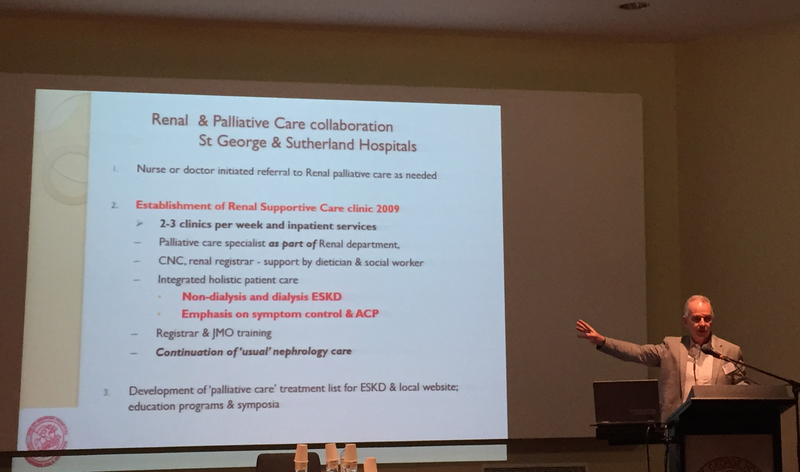 A truly multi-disciplinary audience comprising nephrology, palliative care, geriatrics, trainees, specialists, nurses, social workers, dieticians, et al met on a warm and wet weekend at the St George Hospital in Sydney. All shared a commitment to making life better for individuals with advanced kidney disease. I would highly recommend the weekend to everyone involved in caring for (or researching in) individuals with advanced kidney diseases. Check the St George Renal Service website for updates! This entry was posted in Clinical, conferences, Education, Practice and tagged Integration, Kidney, Model of care, Renal, St George, Supportive care by Chi. Bookmark the permalink. agree! Palliative care goes anywhere!